Members of the D.C. chapter of the International Dark-Sky Association represented IDA on May 12 at a Migratory Bird Festival in Arlington, Va. More than 200 people, including many children, attended the festival sponsored by Arlington County Parks and Natural Resources at Lacey Woods Park. Through informal discussions with attendees, IDA members Marcia Montgomery and Wayne Savage described the negative impact of artificial light at night on migrating birds. May 12 at Lacey Woods Park in Arlington. Most bird migration occurs at night, when excessive and poorly designed urban lights can disrupt avian navigation, sometimes with fatal results. Festival attendees responded positively to IDA's message and left email addresses for follow-up contact. Arlington County Parks has invited IDA to attend a Bat Fest from 6:30 to 9:00 p.m. on Aug. 25 at Gulf Branch Nature Center in Arlington. Artificial light at night impacts bat foraging behavior in ways that are not fully understood and may interfere with navigation of bats and disrupt their circadian clocks. For the past several years the Rappahannock League for Environmental Protection has been a champion of the county's starry skies and nighttime rural character. They have hosted events (including a presentation from Virginia IDA and star watches), done the kind of neighborly outreach that's such a wonderful part of country life, and most remarkably, they have diligently worked with Rappahannock Electric Cooperative to make positive changes to the type of pole lighting used in the county. During the 2016 and 2017 Virginia General Assembly sessions, the Virginia chapter of IDA opposed legislation introduced by Delegate John Bell (D-Loudoun). (You can read an explanation of why in our post dated February 2, 2017 under "older posts"). This year the legislation returned as House Bill 58 and our concerns were the same as in years past: mandating LED lighting for all state properties and facilities is risky. The absence of a Color Correlated Temperature limit, exemptions for places where protecting the night sky and nocturnal habitat is a priority (including existing and potential certified Dark Sky Places), or any mention of adaptive control is a recipe for a well-intended law producing bad public policy and worse lighting. Energy-efficient technology does not equal environmentally responsible lighting when decisions are based only on efficiency (and cost) and not on comprehensive consideration of the full effects of lighting on our environment, natural and built, and on us. Nor does it guarantee energy savings. Unfortunately, recently published research suggests that our tendency to respond to efficiency gains with increased consumption likely applies to LED lighting, with light pollution continuing to spread and intensify. 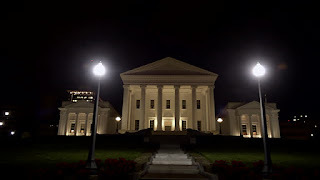 Earlier this month Virginia IDA and the Smart Outdoor Lighting Alliance addressed these concerns again with Delegate Bell. As a result of our conversation, Delegate Bell agreed to amend HB58's language to include a compromise CCT limit of 3500K and exemptions for state parks, astronomical observatories, and environmentally sensitive areas. (The CCT limit is still above the 3000K limit that is the standard for IDA, SOLA, and the American Medical Association, but without any limit at all there was nothing to stop a state procurement process from unleashing 4000K, 5000K, or even 6500K lighting because it's the most "efficient"). As a result of these changes, Va. IDA has taken a neutral position on HB58, neither supporting nor opposing it. We appreciate Delegate Bell hearing our concerns and his willingness to include us in the process of amending his legislation. HB58 left a subcommittee of the General Laws Committee on a 5-3 vote and has been referred to the Appropriations Committee at which time the new language will be incorporated. You can follow HB58 here.